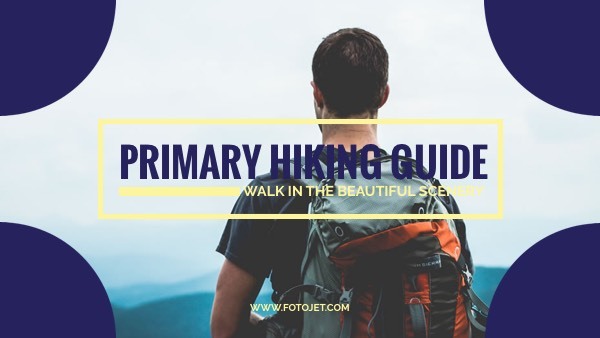 Nowadays hiking is one of the most popular activities in the world for those who are looking to explore the world and get close to nature. And a helpful hiking guide is a must when people plan a hiking travel. So if you’re one of those who have a good video to help these hikers, why not use a special YouTube thumbnail to attract viewers? This YouTube thumbnail template is a great fit for you. To make this layout more personal, you can use your own image and style the text. You also have other editing options with our easy-to-use tools. Get a 7-Day Free Trial of FotoJet Plus! Access the advanced editing tools, custom size, save/load project features. Easier to find a design from abundant premium templates to meet your needs. Premium clipart images, fonts, effects, overlays and frames make your creations stand out from the crowd. Edit in a larger canvas without distractions. Your information is 100% secure! Click "Check out with PayPal" below and complete your payment on the popup security window. Payment failed! Please try again or pay by credit card. Please enter a valid cardholder name. The card security code is usually a 3 or 4 digit number printed on the back or front of your card. On the back of your card, the last 3-digit number after your main card number in signature box is your security code. On the front of your card, you will find a 4-digit security code, just above and to the right of your main card number. Please enter a valid security code. The emails you've entered do not match! An error occurred during the upgrade, please check your network and try again later.If you’re still unable to solve the problem, please click the link below to contact us. Are You Going to Leave? Please pick a reason why you decided not to continue. You will not be charged anything if you cancel your subscription before the 7-day free trial expires. To activate your 7-day free trial, you need to confirm your billing information first.